Early in the debate, while discussing cuts to federal funding, Romney mentioned that while he "loved" Big Bird, he planned to cut funding to PBS, in order to cut back on the money the U.S. is borrowing from China. While we have seen many major revolutions take place using social media, this comment sparked the creation of numerous satiric Twitter accounts related to Big Bird (@FiredBigBird) and other characters from Sesame Street (@FiredOscar, @FiredBernie, etc.). The @FiredBigBird account was later suspended to only be reinstated due to the outcry's of individuals in the Twittersphere (the account is currently suspended again, but @FiredBigBird2 was created). In addition, numerous celebrities posted comments defending Sesame Street and Big Bird. In addition to Twitter, people took to Facebook to create Fan pages for Big Bird. One Fan page, Save Big Bird (see image below), currently has over 8,500 "Likes" as I write this post and has a variety of articles related to Romney's comment, memes, and comments from the community supporting this cause. In my Social Media course (#srusm), I spend an entire week dedicated to discussing online identity and reputation by examining personal and professional representation of both individual and brand. It was timely to be discussing reputation in class this week with KitchenAid and the tweet posted to their account about Obama's grandmother - referencing Obama's remark about how his grandmother passed away three days prior to him being elected President. "Obamas gma even knew it was going 2 b bad! 'She died 3 days b4 he became president." 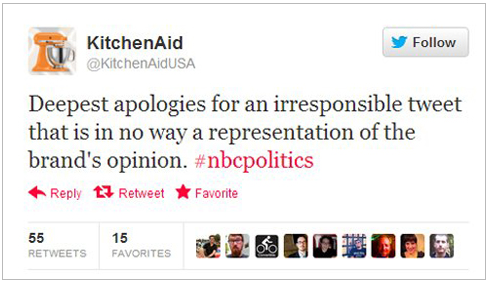 A KitchenAid representative later tweeted an apology. This is another case where an individual accidentally posted something to the brands account, when it was intended to be tweeted to their personal account - reminds me of a similar incident with Red Cross's "getting slizzard" tweet. While there was a big milestone for Twitter and a lot of conversation on the major social media platforms, I look forward to what the next month brings as the election approaches.